Mindful Moment: I started the day with knowing I wanted to pull two Oracle cards. One for guidance with the receiving of everything that experienced yesterday’s workshop and one to guide me into today’s workshop. I signed up for Bree’s Breathing into Alignment Workshop: Open the Gateway to Your Soul Through Breathwork after Rachel told me she was really inspired by the work of Bree and that I' should come. Also Rachel was going to be there so 100% I was in ;) I went into last night having no idea what to expect and what I physically felt blew my mind. You can read more about the workshop here. I started to write more about the workshop but I my head started to itch and this is always a sign for me that whatever it is, it isn’t right. So I’m just going to leave it at this. Going into today I am stoked for another one of Bree’s workshops. Initially when I went to book the Friday one, I secretly wanted to the Saturday one instead but I trusted Rachel’s choice and so Friday it was. 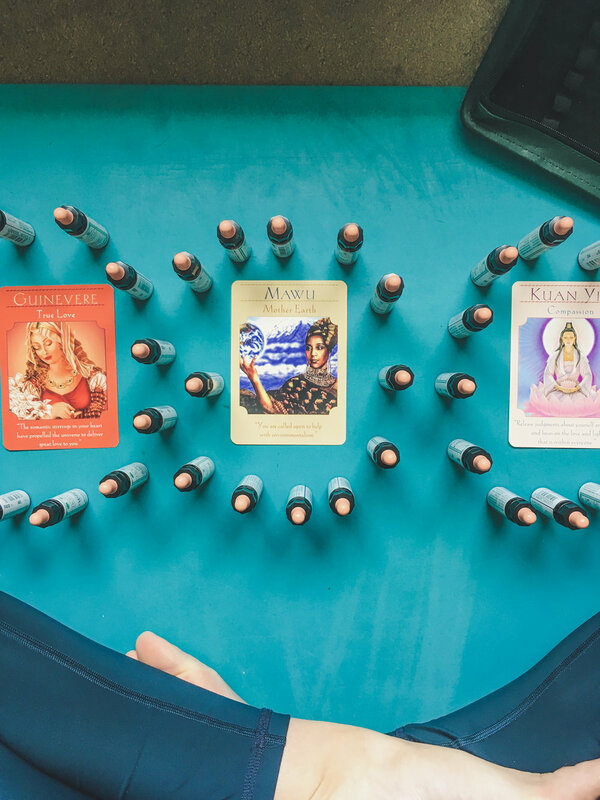 Leading up the event I kept forgetting whether the event was on Friday or Saturday and there was a part of me that really felt fomo about not going to the Intuition and Soul Connection Workshop: Reawaken your Innate Intuition + Create a Deep Connection with Your Soul. Classic example of intuition speaking loudly and me ignoring it. Needless to say I booked Saturday’s class right after the Friday workshop finished and I could not be more jazzed. You can read more about it here. So back to the Oracles. Guinevere was a jumper so that’s exciting and after she jumped I still felt inclined to pull two others. From yesterday’s workshop my relentless inkling that I am in this life to bring others back to nature so that they can just be and receive, was affirmed. Although I was initially discouraged with pulling Mawu (Mother Earth), I now clearly understand why she has been called upon to guide me through the transitions and inner workings of yesterday. Thank you. I have not pulled Kuan Yin (Compassion) before; not for myself nor for others so I am intrigued. I hope to channel Kuan Yin’s guidance and divine power for the session today. I will keep you posted. Notes: I want to learn more about breathwork. I saw myself taking Rachel into the Heath and fully experiencing nasal running, cold pond swimming and then walking and chatting. I want to learn more about the ways you can alter breath in different mindful movements (ie. running, dancing, swimming, cold water immersion, strength training, etc.) to enhance the experience or recalibration between the head and the heart. Arrangement: An infinite figure 8 to cultivate power in a network of shapes/symbols, oracles and the power of the flowers. The ancient wisdom that will will always be. The Pick: The one left behind, yet still loved and empowered, from the infinite figure 8. Observations: Weight on my chest pushing down. Block in my throat >>> swallow; like what I imagine acid reflux to feel like. Tension. Constraint in and between my upper chest and throat. Held there. Trapped. Primary Remedy: Ranting and raving. Hatred, envy, jealousy, suspicion, aggression. Secondary Remedy: Bad tempers and suspicion of other people’s motives/judgement. Because Holly remedies the very powerful and destructive states, it is considered the most important flower remedy. As an observer of a Holly sufferer, it is easy to sympathise with the victim of the other end of a Holly rant, however it is the rager who needs the most sympathy. These feelings come from an absence of love, leaving the person to feel cheated and alone. If un-dealt with, these negative emotions are stored in the body and eventually manifest themselves in the form of sickness. Something I read it wrong but it highly resonates with me is that Holly is firey (which was actually written as fiery). This is combustible, strong, and aggressive. Think of someone who starts on a tangent and goes into a full blown rant. This is someone in need of Holly. Meditation: Coming after I have written this. Regardless of whether people actually feel any different or see any improvements, the practice of taking 3-10 minutes a day just to check-in with yourself and become aware of how you feel in this moment - taking the remedies makes you take notice. This in itself is a remedy for everyday life because it puts you in the now! The conversation with me proceeding to tell him about how they are similar to the oracle cards but different in a major way. My belief was: the oracle cards in-still hope and make you look for how that angel of optimism and guidance is showing up in your life, whereas the remedies are like a cold slap to the face because they highlight an emotional stress that you are struggling with in that moment. And though I love to be a shadow advocate by bringing it to the light, I contradictorily did the exact opposite. I recoiled and started to question why anyone would want to look in a mirror of improvement everyday and feel worse about themselves. I started to wonder if taking them was actually a good idea for me? Why would anyone want to remind themselves of the ways that they are inferior?! With a sour taste in my mouth I decided to leave remedies (not even nicely in their case but rather a mess on my floor, under the altar) and leave them for a bit. 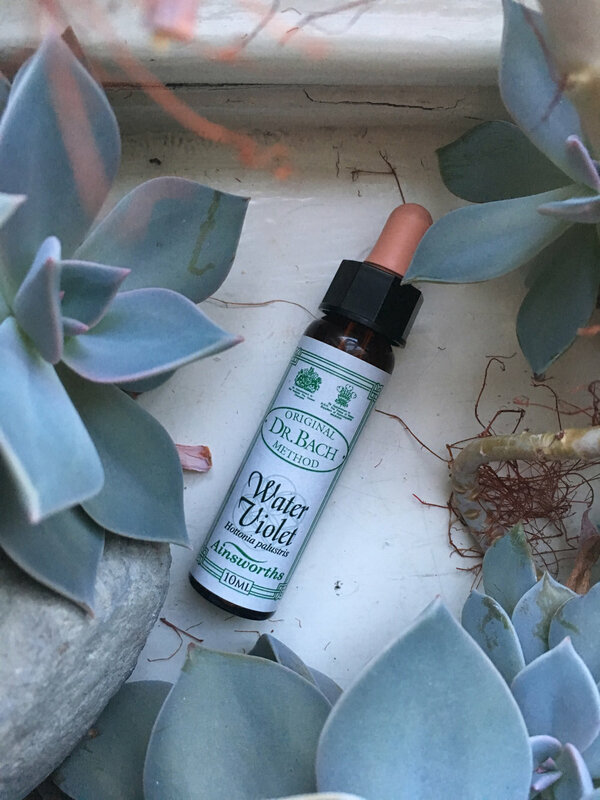 I got Water Violet as a jumper on Monday when I was dashing to work and I had no time to do anything but grab the first one out of the case and bring it with me. I quickly downed the drops in a cup of water on my break and barely took notes. In fact the practice and love for it was non-existent. I felt shame. I will write more tomorrow, but for today this is where I am at. I have felt that on Monday, Tuesday and (now) Wednesday that my journey with the remedies is in a place of doubt and that I am to experience them with sharing them in the format I have previously created. I will update you as I feel called to and I am excited to continue my journey led by my heart rather than the framework of my brain. Primary Remedy: Superiority. Withdrawn as a result of their own inner wisdom. Secondary Remedy: Tension that has manifested in the physical from the emotional. Tight shoulders, stiff hips, etc. Receptivity: The inner wisdom is abundantly shared and lovingly received. Pride is replaced with sympathy.